Prime Minister Narendra Modi hailed the spirit of Indian-origin Tamils in Sri Lanka and announced the construction of additional 10,000 houses in upcountry areas and the extension of Emergency Ambulance Service. Prime Minister Modi assured Tamils that the government and people of India are with them in their journey towards peace and greater prosperity. He also announced a series of sops for the Sri Lankans like setting up of vocational training centres, ten engineering training centres and labs to impart suitable skills, computer and science labs in plantation schools. Prime Minister Modi was hailed by a mammoth crowd when he referred to their leaders like Saumiyamurthy Thondaman and appreciated their bid to keep the social fabric of the beautiful nation intact. "Diversity calls for celebration and not confrontation. Sinhala and Tamil people and languages existed harmoniously, we need to strengthen not separate these threads of unity harmony, Tamils of central Sri Lanka are the best placed for this. 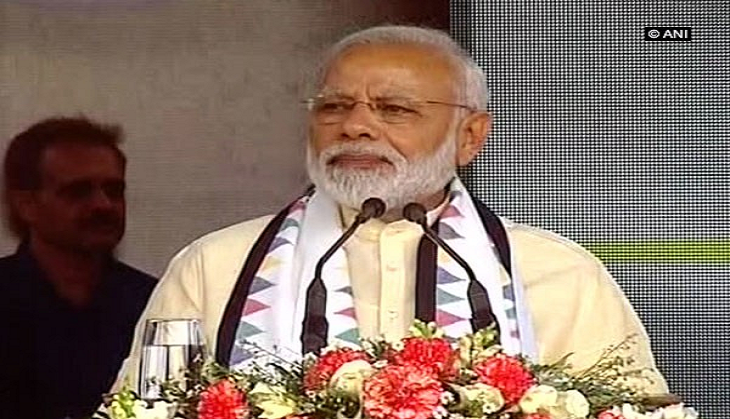 We remember and salute the struggle of Tamil people of central Sri Lanka, their forefathers and leaders like Saumiyamurthy Thondaman," Prime Minister Modi said. Recalling visit of Mahatma Gandhi to the country's central area 90 years ago to spread the message of socio-economic development, Prime Minister Modi said that in commemoration of Gandhiji's historic visit, Mahatma Gandhi International Centre was set up with Indian assistance in Matale in 2015.